It is rather amazing to be at a celebration of 1968 that begins, and also ends, with reflections by feminists on women’s position in the Sixties. Certainly, it is usually not women who are highlighted in reflections upon what became the iconic year of that momentous decade. Yet, far from it being simply tokenism to ensure the inclusion of a few women’s voices, retrospectively, it now seems quite essential to draw attention to women’s place in Sixties memorabilia. Merely saying so, however, brings to light at least two things. 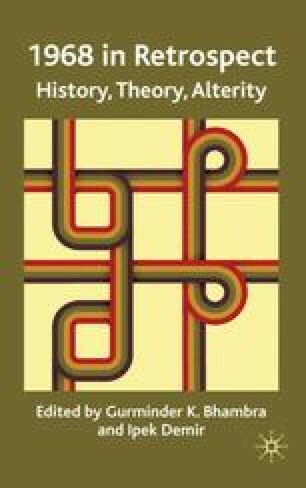 First of all, it confirms how distant we are now from the structures of feeling 40 years ago; second, and most interestingly, it indicates how memory itself mutates, allowing us to look back and see the past differently, differently from how it was seen at the time, or even how we might once ourselves have looked back upon the era.